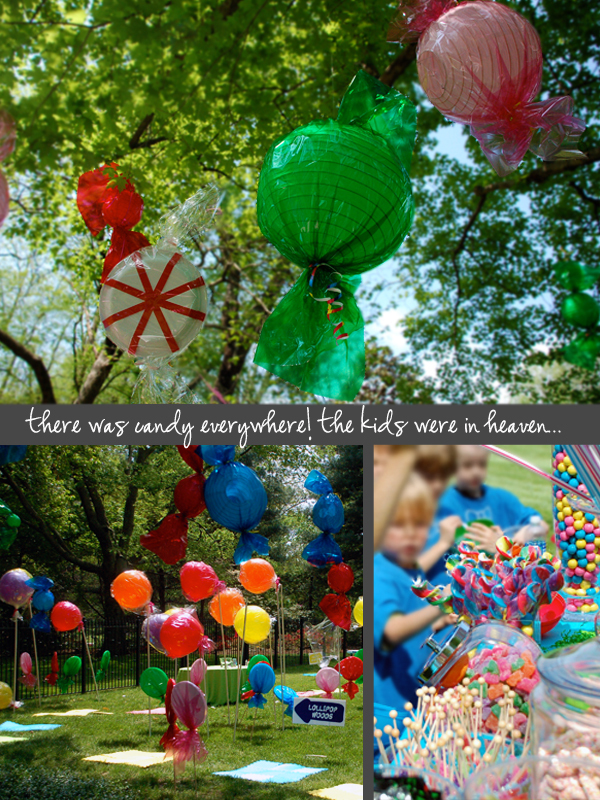 Welcome to Easter in Candy Land! One of our client’s requested our help to throw an Easter party for the Kindergarten classes at her son’s school. We were thrilled at the opportunity to throw a bash that would be enjoyed by a group of fun young children. For weeks, our office has been filled with everything from building insulation to beach balls to pull off the decorations seen in the following pictures and we enjoyed every minute of it! Above is the entrance into life-size game board where the children were given t-shirts coordinating with game pieces and divided into teams. We had giant candy bars greeting the anxious group of young boys and girls, needless to say, it got them excited for the candy-themed day of fun! At Lollipop Woods, the kids made candy necklaces which proved to be more popular as a delicious treat, than a pretty accessory. 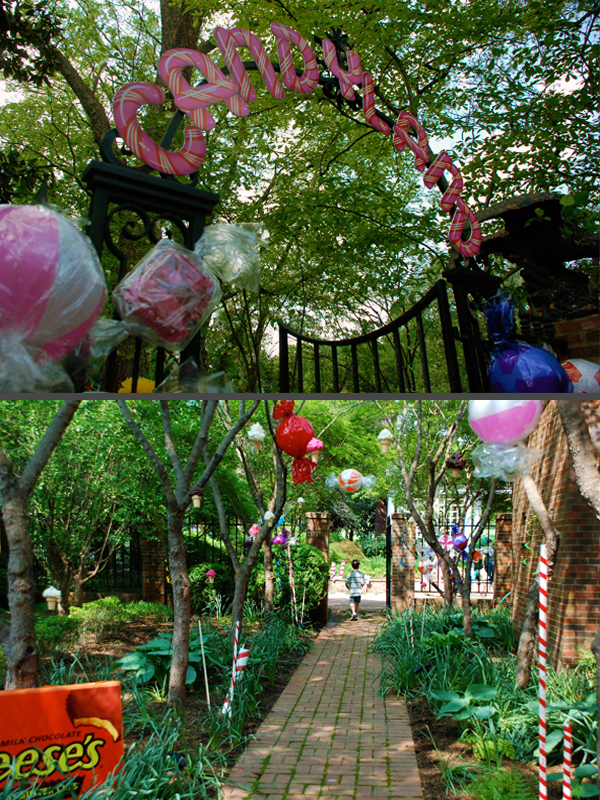 The lollipops decorating the station were created from styrofoam discs and balloons wrapped in multi-colored cellophane. The bright hues were the perfect match against the kids’ high energies. Once they had made it through the woods, they landed at King Kandy’s Bar where the children continued their candy adventure and filled their own plastic bowls to the rim with a variety of sweets. It was the Chocolate Swamp where the mess began! Each child was allowed to dip a cookie or a piece of fruit into the delicious chocolate fountain that was provided. 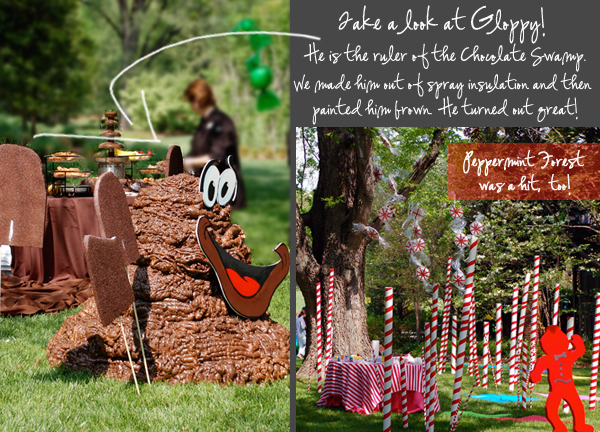 A river of chocolate flowed from the trees and was achieved by spilling brown theatrical fabric over the limbs and into Gloppy’s swamp. Peppermint Forest was exciting for the kids as each marveled at the giant red-and-white striped sticks coming from the ground. This was achieved by cutting and wrapping PVC plumbing pipe with red electrical tape. It was here that the kids enjoyed some art (which was a nice retreat from the sugar overload! ), and each was allowed to paint an Easter egg. When the game was finished, the children had one more surprise left. The Easter Bunny was waiting for them to join him and hunt eggs! 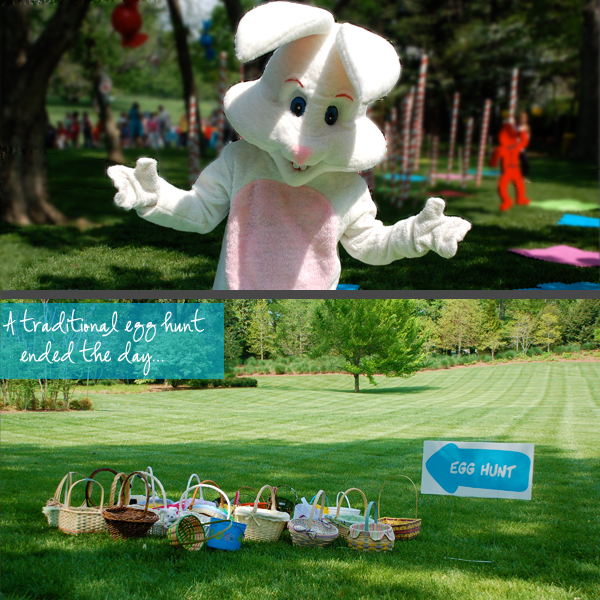 After each received their own basket, they set off into a field that had dozens of hidden eggs waiting to be found. Absolutely amazing — so much creativity!